This is a purely just "playing-around" post. In Uqbar Project we are now using several new languages both as part of teaching programming in a couple of universities, but also as one of our main/many languages of development for research projects. But I'm not going to bore you with that right now. Probably this will be the start of a series of post related to this language (an why not some other regarding scala and groovy) and rethinking our programming practices and design decisions with its particular mechanisms. At the end maybe some kind of summary post. Anyway back to the original point then I wanted to try out extension methods. But not just adding methods to a class. That's easy. Beyond just methods, OOP most important feature is polymorphism. So, how extension methods relates to polymorphism ?? Then, wait, maybe you are wondering what's this extension method thing ? For those who are not familiar with the term extension methods is a language-level support for defining new behavior (methods) for existing classes, without actually touching the original classes. And of course, then use those as regular methods. Usually this takes the form of a method whose first parameter is the target object. Belonging to the class we are extending. There are several different implementations of this concepts in many languages. For example C# "Extension Methods" can only be defined as static methods. So enough of introduction. Maybe we will create a separated post to compare the different extension method mechanisms in several languages. And we could create another post just to talk about xtend's extension methods. Adding a method to a class is great as you have seen to add some kind of "atomic" functionality. Like all utility classes that we use like CollectionUtils, ReflectionUtils, ListUtils, etc. Now, can we use it to add polymorphic behavior ?? The short answer is ... YES ! This can be achieved by combining extension methods with multiple dispatch, another nice feature of xtend. Remember that the target object is the first parameter of the extension method. Also remember that multiple dispatch is the ability to select the method implementation based on the actual type of the arguments. So they complement each other quite well. We can create an extension method, which is actually a set of different methods one for each target type (first argument). Then call it as if it was a regular method with different implementations on each class. Like a regular polymorphism with classes overriding. And here's a piece of code that demonstratse it. Suppose we have some kind of CandyCrush object model. There are Candy's and different classes for Movements (Move): to go North (move up a candy), go South, East, and West. 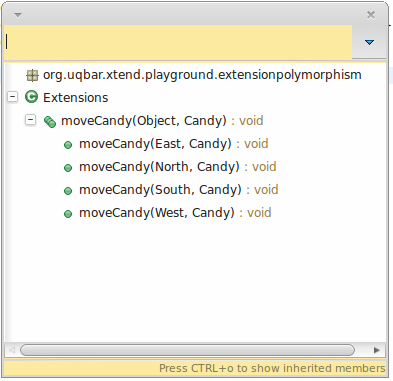 Suppose the "Move" class don't actually have a method to move a candy (ok, sounds silly, but just for the sake of the example). We will like to add a new method ----> Ahá !, Extension methods !! But wait, each Move subclass will have a different implementation ! We need polymorphism !!! -----> Ahá!, Multiple dispatch ! 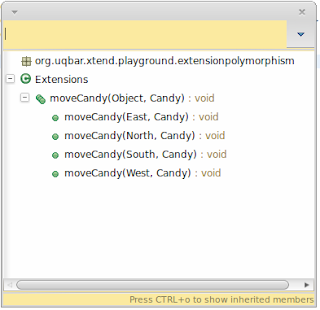 The "moveCandy" is the actual polymorphic method that we want to add. So even if we coded several methods (4), conceptually we have just added one method and several implementations for concrete types. That sounded great !! 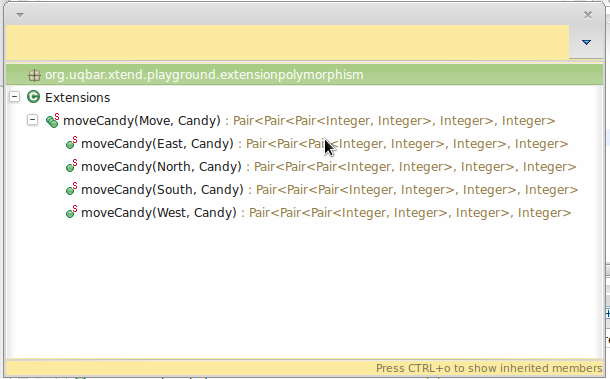 I can add polymorphic method to existing classes. But can I do it to any class ? Can I, from the outside, make two different classes polymorphic in respect to a new method ? Yes, you can, but it will have some drawbacks. In our example we added a polymorphic behavior to classes which already where polymorphic as part of being in the same hierarchy. But what if they weren't ? What if they were just completely different classes with no hierarchy ? Well there's still a multiple-dispatch method. That's fine. It's just that it applies to any Object. Mmm... that's not good, but, well.. at least it's there and it still can be used in our main ! An advantage of the polymorphic extension methods approach is that of course, it allows to add that behavior from outside of the class. Sometimes you cannot change the original classes. But also another one (that could also be seen as a disadvantage) is that it groups together all the "move" behavior into a single place. Kind of a concern applied in AOP. This effect is also similar and sometimes part of the intention also present in the Visitor Pattern. Where the visited class only knows how to transverse each other in a general algorithm, then each visitor implements the actual logic for each visited class in a custom method. In order for this to work you need to simulate multimethods with double-dispatch. So what happens with the visitor pattern now that we have multimethods, but also we can combine them with extension methods to actually "inject" the polymorphic behavior ? Does it still make any sense ? Last, we have saw that you can use this mechanism even for unrelated classes, but then you end up using Object, because you can add methods from outside, but you cannot change the type hierarchy or force classes to start implementing interfaces (like for example in AOP with weaving). Related to this, there languages like Scala which implement a duck-typing in a strongly typed environment (checks on compile-time). These are a form of StructuralTypes. Through extensions we have actually defined some kind of new "structural type". A new type which represents objects which can "move a candy". Why should we type any other method that receives such an object via parameter with "object" ? Would it make sense (or be possible) to introduce new types, using the extension type itself as a nominal type on top of the structural type defined by the extension methods ? Would it be possible to combine ext.methods + multiple-dispath + duck typing ? If you check our Extension class after we've removed the hierarchy you'll see that there's enough information for a clever compiler to see our modified main and know that it will fail ! It just needs to inspect all the dispatch methods to know which types are valid and which one are NOT ! Banana isn't a valid type. Extensions don't need to be static methods (as in C#) therefore they are implemented in instances of a class. Therefore, into an object. But then you just call with the first arg as target. Eventually there's an automatic delegation or dispatch to the method into the extension object instance that you have (from the piece of code you are calling it). The extension itself is an object and a regular class, therefore you could create a hierarchy an use polymorphism, having different sets of implementations for the extension themselves. In this case we have it just hardcoded there in the initialization. But the extension instance could be injected. Also note that we are also changing the extension instance with the new one. Therefore just by changing the reference to the extension (like if it was a prototype's parent object) we change the implementation of all methods that affects several classes (North, South, etc). Also kind of changing an aspects implementation.